Spring is an ideal time to tidy up your lawn, fix any needed repairs and plant a few blooms to have your grounds looking its best. #1: Will I need to fertilize and irrigate my lawn? To keep your grass healthy and green, it needs to be fertilized two to three times a year. Springtime is one of the important times to provide a dose of fertilizer because after coming out of winter your lawn needs nutrients. Fertilizing in the spring helps to strengthen grass roots to enable healthy growth for the upcoming summer season. Also, be sure to ask your commercial landscaper whether they use synthetic or organic fertilizers. Schill Grounds Management uses a blend of mainly organic fertilizer with a touch of synthetic fertilizer to produce lush, weed-free lawns. Our bio-nutritional fertilizer helps reduce the amount of synthetic fertilizers by 50% while naturally balancing soil pH levels. To maintain a lush lawn, regular irrigation is needed. It's generally recommended that your lawn receives a minimum of one inch of water a week, preferably in the early morning or evening to prevent evaporation by the sun. Ask your commercial landscaper whether your irrigation system is in need of repairs. #2: How often will you provide service? How often your commercial landscaper comes to visit your property is indicative of their dedication and commitment. If your landscaper is vague about how often they plan on visiting, or is simply too busy to commit to a regular schedule, it may be time to look for another company. Springtime comes with a lot of landscaping duties that are best tended to on a weekly basis. Imagine the difference between monthly vs. weekly services such as mowing the lawn and pulling weeds. Things could get out of control very quickly. As a commercial property manager, you want to present a professional and welcoming image to your clients. An overgrown weed-infested lawn is not attractive. #3: How will you help control weeds? Weeds are problematic for every lawn and need to be regularly controlled. In Northeast Ohio, a few common weeds include bull thistle, dandelions, sweet clover and annual ryegrass. The type of herbicides used is important to consider, especially if young children and pets will be playing on the grass. A good landscaper will be familiar with the types of local weeds growing in the area and have knowledge about the best ways to get rid of them with minimal harm to surrounding plants. Ask your commercial landscaper about the type of herbicide they use. Does it also contain pesticides and insecticides? The use of pesticides and insecticides should be limited to an ‘as-needed’ basis as they contain a myriad of chemicals that are harmful to people and surrounding foliage. #4: What other services do you provide during the spring? Spring cleanup. This includes raking dead leaves and twigs, edging for sidewalks and walkways and cleaning pathways. Planting new plants and flowers. What’s springtime without a few new pretty blooms or native shrubs? Whether you want to plant a few simple flowerbeds, or completely overhaul your existing grounds with a new design, a commercial landscaper can help. Tree and shrub pruning. Just as you need a regular haircut, your trees and shrubs could use some springtime pruning to look their best. Mulching. Mulching helps create rich and fertile soil that encourages healthy grass and plant growth. Mid-spring is usually the ideal time to lay down a layer of mulch. Mulch helps to retain soil moisture, prevent soil erosion, prevent weed growth and creates an overall tidier appearance for your property. #5: What areas need improvement? A reliable landscaper should be able to provide suggestions for improvement after an onsite visit of your grounds. Whether you need to repair your irrigation system or treat diseased trees, you’ll benefit by taking a proactive approach to maintaining your grounds, rather than waiting until a problem festers. 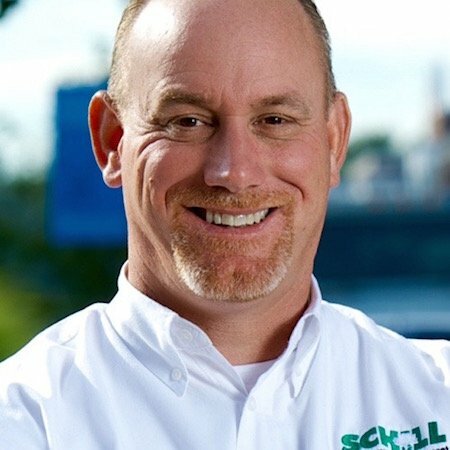 Schill Grounds Management provides weekly onsite visits and we use the latest eco-friendly landscaping techniques. For a FREE onsite analysis, call us at (440) 327-3030 to find out how our team of experienced landscape professionals can work for you.